The weather has been beautiful lately.. The last little bit of warm vibes before fall really slaps me in the face and tells me to put my sandals away. Although she might have to slap me twice because I’ve been known to rock my sandals well into December. As the weather turns into that cold mess, causing me to throw on like 8 layers of clothes like Johnny Depp. I find myself cooking more.. I might even make it to posting twice a week at some point. Don’t hold me to that..
One of my favorite things to make.. other than a martini..is biscuits. So me thinks there should be more of that.. ya dig? 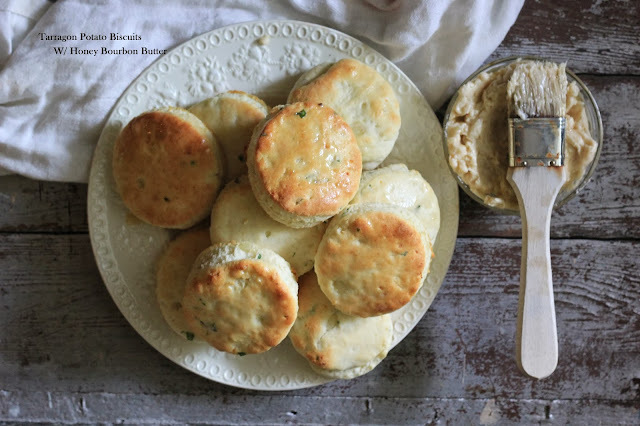 It’s a southern soul food rite of passage that you learn how to make biscuits like Big Mama made biscuits. Using White Lily Flour, a little lard and few other things. She created the fluffiest, softest, get up with the get down biscuits you’ve ever stuff your face with. I don’t know how to make those..
Well I know how to make them... but not quite like she did.. and until the University of Phoenix creates a course on Big Mama Biscuit making..I’ll just have to wing it till I get it right. According to my mother, the secret was that Big Mama talked to Jesus while she cooked. So I tried this.. but Jesus quickly let me know there is a host of other things I need to be talkin to him about. And none of them have to do with biscuits. Like take these moist and tender Potato biscuits that you can easily throw together with some leftover mashed potatoes. These babies wanna hang with the dinner crowd. They want to be dipped in soups and replace your spoon when scoopin up that chili or stew. I threw in a little tarragon to give them a subtle herb flavor.... Then I threw a little whiskey in my butter to slather all over these bad boys. Because really honestly truly like for real. Bourbon should be spreadable and eatable. It should also be sold at Starbucks so I could just have it added to my coffee on the way to work rather than having to keep mini bottles in my purse. In a large bowl whisk together four, baking powder, and salt. Using a pastry cutter or your fingers, cut in chilled shortening and mashed potatoes until mixture resembles course “feta-like” crumbles. Allow to chill in the fridge for about 10 mins. Stir in tarragon and buttermilk to chilled dough until moistened and combined. Turn dough out onto lightly floured surface. With a lightly floured rolling pin, roll the dough to about 1/2 inch thick. Dust the top of the dough with flour and fold it crosswise into thirds. Roll the dough again to about an inch thick. Cut with a 2 inch biscuit cutter and place dough rounds 1 inch apart on a baking sheet. While biscuits are cooking, make honey bourbon butter by combining the softened butter, honey and bourbon until smooth and combined. It will require a little elbow action.. Whipping the butter to get that smooth texture. But it’s worth it. Or as my husband reminded me after the fact you could just use your mixer. Once biscuits are done, remove from the oven. Serve warm with Honey Bourbon Butter dripping from the top.